Zhi Dao Guan is the school where I continue to train in Chinese martial arts. Dr. Alex Feng has been teaching Judo, Taijiquan, Baguazhang and weapons forms in Berkeley and Oakland, CA. for over 30 years. He is also a nationally recognized doctor of traditional Chinese medicine and an acclaimed Taoist Master who is the lineage holder of the Zhi Dao Taoist tradition. Taught and mentored by his father, Dr. Wei Ren Feng, Master Feng grew up immersed in an environment of Taoist culture. 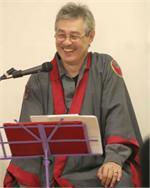 Dr. Feng has taught Taoism and been a leading force in bringing Taoism to the West since the early 1970's. On the last Friday of every month at 7:00 pm, Dr. Alex Feng talks about Taoism and leads Taoist meditation exercises. These events are free and open to the public with donations gratefully accepted. There will be padded folding chairs and some floor cushions. Please feel free to bring your own sitting cushion if you like. Tea and cookies to follow the class. -Zhi Dao Kuan is several blocks down, on the left side (big maroon awning): 3824 MacArthur Blvd.